Season four opens with the live episode "Ambush", performed twice . Dr. Morgenstern, head of the ER, has a heart attack, threatening his life. Weaver agrees to temporarily step in until he recovers. Unfortunately, when Morgenstern does come back, he cannot perform surgery like he used to do because he now knows what it is like to be a patient. After a surgical accident that takes a man's life, Morgenstern decides to permanently step down as head of the ER and he leaves the hospital. 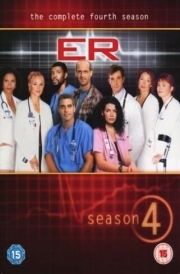 Two new physicians join the ER: Dr. Anna Del Amico, played by Maria Bello and a new British surgeon Dr. Elizabeth Corday, played by Alex Kingston. Corday came to America under the fellowship of Dr. Robert "Rocket" Romano , but their relationship sours towards the end of the season. After she rejects Romano when he asks her out, he decides not to renew her fellowship. She is forced to choose whether she moves back to England or stays in America as an intern. Meanwhile, as Greene copes with his beating, he and Ross take a vacation to Arizona to bury Ross' dad. While there, Greene visits his own parents, where he finds out that his mother is sick, and his relationship with his dad is estranged, at best. Back in Chicago, he begins to date new ER desk clerk Cynthia Hooper . The relationship is purely physical, and when Greene has to visit his parents again later in the season, she comes along, only to realize that Greene does not love her. After the awkward breakup, Cynthia leaves, but Greene stays to better take care of his ailing mother and begin to mend his relationship with his father. Ross and Hathaway get more serious when Ross surprises Hathaway and proposes to her in front of the ER staff, which she accepts. She later has commitment issues when she kisses a vulnerable paramedic. She tells Ross, and he reacts angrily. After a short time, Ross forgives her and tells her he will wait until she is ready to be married. In addition, Hathaway is able to open a free clinic in the ER with the help of Carter's grandmother. Ross vies for a pediatric attending position in the ER. A lonely Corday starts a relationship with Benton, which causes friction with Benton's family because she is white. Weaver attends a Synergix seminar to see how to better manage the ER. She begins to date a Synergix representative, Ellis West, who advises her to fire a physician's assistant, which happens to be Jeanie Boulet. Jeanie fights for her job, claiming that she is getting fired because of her HIV status, and wins. Weaver begins to see Synergix's dark side, and breaks up with West because she feels he is using her, effectively cutting off all ties with Synergix. During all of this, Jeanie's ex-husband/current partner Al is forced to reveal his HIV status. This gets him fired and forces him to look to Atlanta for a job, and he asks Jeanie to join him. Jeanie refuses, and Al leaves her. Later in the season, Jeanie cares for Anspaugh's dying son, because she is the only person able to get through to him. After he dies, Anspaugh feels much gratitude and remorse towards Jeanie because he was willing to fire her. Carter pretends to be poor in order to get in Anna's good graces, which fails because she finds out he was lying to her. But, the two still become good friends, and she helps Carter help his cousin Chase detoxify from a heroin addiction. She had experience in the subject, considering her ex boyfriend went through a similar experience. Unfortunately, their efforts were in vain, because Chase started using again, eventually crippling him for life. At the end of the season, Anna's ex-boyfriend comes to the hospital to see if the ER is in need of a Paeds attending. Anna is still in love with him, and faces a decision about her future in the ER. # 10 - Do You See What I See? Whole or part of the information contained in this card come from the Wikipedia article "ER (season 4)", licensed under CC-BY-SA full list of contributors here.